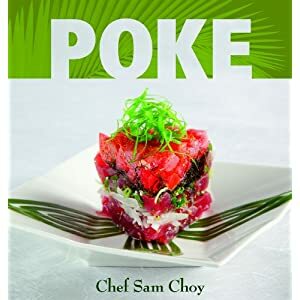 This is an elegant way to serve your favorite poke. 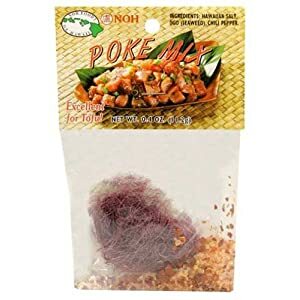 This version uses spicy ahi poke. It is so spicy that I needed something to cool it off so I used creme fraische on the top. Recipe provided with permission by Scott R. Davis!! Add the chives to the tuna pok?. Cover with plastic wrap and refrigerate. Using a mandolin, slice the cucumbers lengthwise as thinly as possible into approximately 5-inch lengths. Or if you're really good with a knife, you can slice them by hand. Season with salt and pepper to taste. Place 1 heaping teaspoon of the tuna tartar on one end of the cucumber slice. Roll up. The cucumber, when very thinly sliced, will stick together and stay rolled without a toothpick. I still almost always use one anyway. Continue making rolls with the remaining ingredients. Using a small spoon top each roll with a small dollop of crème fraîche, then top with the sesame seeds. You can put the crème fraîche into a zip-lock bag and snip the corner off and use that to make your dollops. It's like a mini pastry bag. Scott’s Notes: Don’t make these too far in advance, they tend to get juicy. Sometimes I make cucumber cups instead of the slices. Choose very thin cucumbers, peel or partly peel them, slice them into 1/2 to 3/4 inch pieces and hollow out part of the center with a small melonballer to make a cup.